Is your mouth watering yet? Note: Pictured here are Fred & Friends measuring cups fashioned after traditional Russian matroyshkas. We at Cream City Cuisine couldn’t think of a better way to celebrate the start of our blog by roasting some baby reds in this smooth, slightly sweet, scotch-style brew. Now wipe that drool off your chin, and let’s get down to business. Pour ale, olive oil, rosemary, shallots, and garlic powder into large zip-loc bag. Note: A trip to two separate grocery stores yielded zero shallots for this recipe. We substituted a small white onion as it’s closer to the sweet flavor of a shallot. 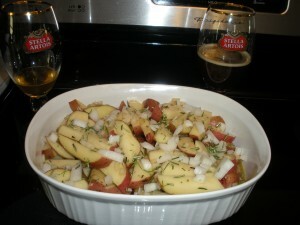 Add chopped potatoes and onions. 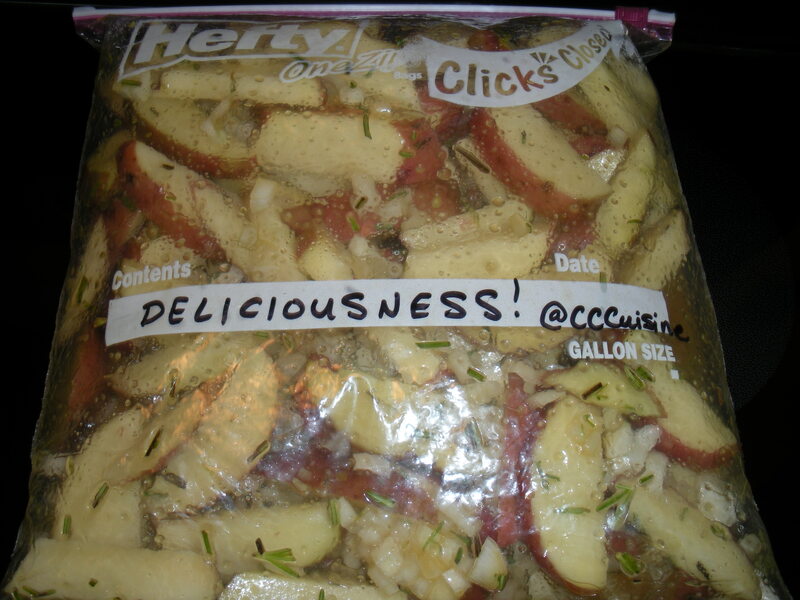 Close seal and shake ingredients until potatoes are covered in the herby deliciousness. 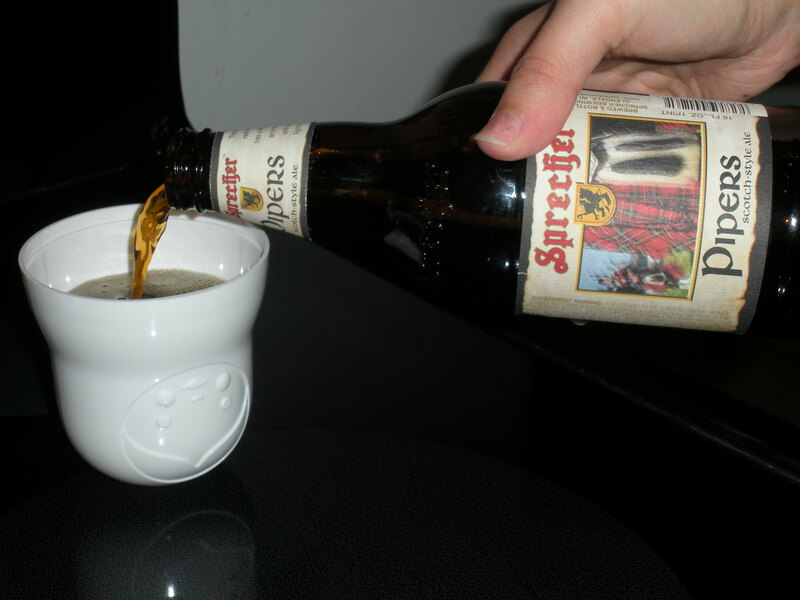 Set aside and let marinate at room temperature for as long as it takes you to enjoy the rest of the bottle of Sprecher Piper’s Scotch Ale. Meanwhile, preheat oven to 425 F and line metal roasting pan with tin foil (if using glass baking dish, no foil is necessary; it just makes for easy clean-up). Tip: A metal roasting pan will brown potatoes better than a glass baking dish. Using a slotted spoon, fish potatoes and onions out of zip-loc bag and place in roasting dish in a single layer. Take 1/4 cup of marinade left in the bag and spoon over potatoes, getting as much of the tasty rosemary and shallots as possible. Cover pan with lid or foil. Bake for 30 minutes. Remove pan from oven and uncover potatoes. Give ’em a stirring they’ll never forget and sprinkle Parmesan cheese on top. The 1/4 cup measurement is more of a suggestion, lay it on thick if you like that sort of thing. 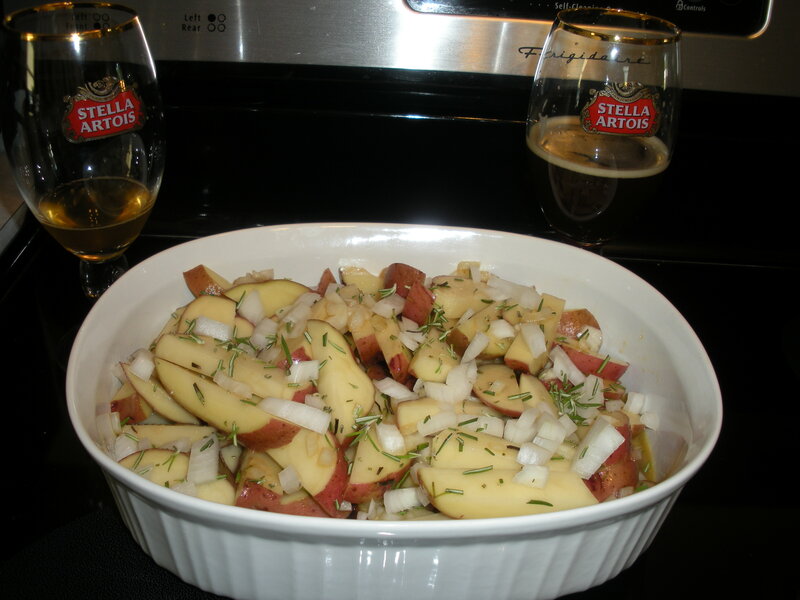 Return potatoes to oven, uncovered, and bake an additional 15 minutes or until they are tender. Remove from oven and enjoy. 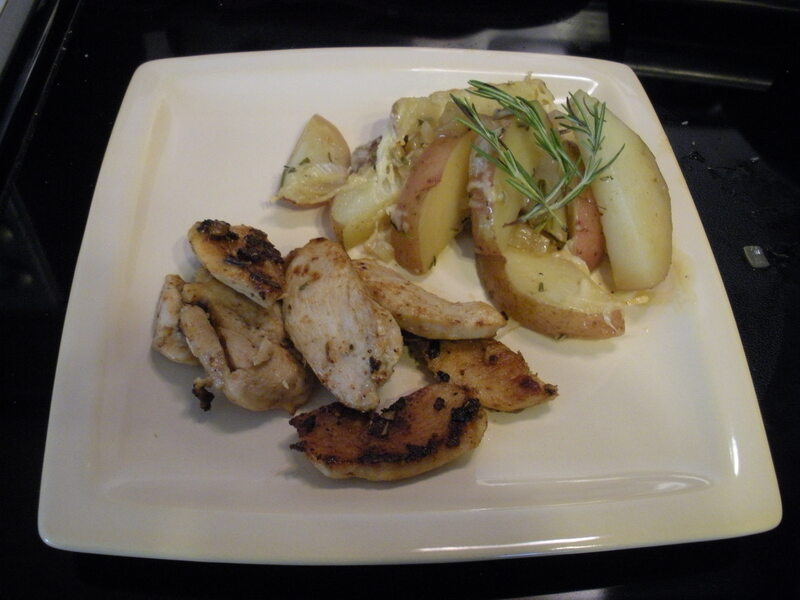 Delicious if served with Evan’s Chardonnay Garlic Chicken. This entry was posted in Side Dishes and tagged Sprecher Brewery. Bookmark the permalink. I can’t wait to try this recipe! I do love this sort of thing. Make sure you let us know how it goes!